It can be quite easy to mock the vehicles that came out of the late 1970s, but the car industry had to keep going and videos like this are a reminder of the cars produced at the time. 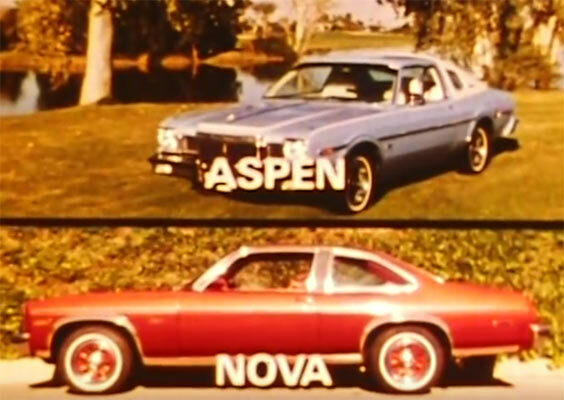 This video showing a 1977 Dodge Aspen vs a Chevy Nova is not much of a competition, but it does give you some insight into how these boxy versions emerged from their greater counterparts. This was a curious time for the whole car market as imports started to flood the market and consumers started to see the benefit of a more compact vehicle. The Nova was really a shadow of its former self by the late 70s, having gone from one of the finest muscle cars to a mixed bag of general consumer vehicle which tried to please everybody, like many of the cars of the time. However, for people of a certain age, TV shows of the late 70s wouldn’t be the same without the vast array of these cars. Check out the short video below and let us know what you think about these late 70s vehicles.